As reported by a number of online news sources like the Sacramento Bee and FairWarning.com: "One of America’s more egregious public health afflictions: deaths and injuries in car crashes, is being massively ignored." At GoLaw.com we accept new cases and don't charge you unless we recover for you. Call 530-674-1440 or Click for a Free Consultation + Home and Hospital Visits! Sources report that although there are "more than 30,000 deaths and more than 2.2 million crash injuries per year, highway safety has largely fallen off the political radar screen." 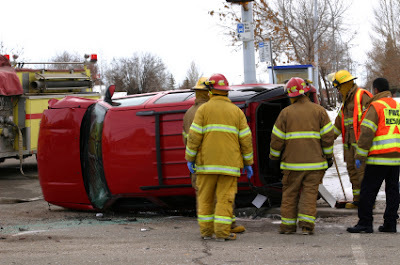 California Accident Injury Attorney Mark A Doughty reminds us "It is up to us to take care of ourselves and our families by staying prepared and placing safety first." "This should be a warning sign to the American people, since political leaders and their families, like the rest of us, are not immune from firsthand encounters with highway tragedies… President Obama’s father died in a car wreck in 1982. In 1972, Vice President (then U.S. Senator) Joseph Biden’s wife and infant child were killed in a car-truck collision. Republican presidential nominee Mitt Romney, as a young Mormon missionary, was severely injured in a collision in France that killed another passenger. These experiences mirror those of millions of ordinary Americans, yet they have failed to prod the nation’s policy leaders into aggressive action to stem the carnage." For more Driving Safety Tips and advice on What To Do in Case of an Auto Accident, go to http://golaw.com/newsletters.